And there is no sign of Arctic summer temperatures being above normal, when the GHG amplification should be strongest. This is the crux of the problem. CO2 is not a climate driver and Anthropogenic Global Warming is a non existing problem. Let alone it will affect the arctic. It’s all hog wash. Hog wash never cost me anything. AGW is an evil plot to destroy liberty. Whoa, whoa, whoa, Steven. Are you sure that this “no warming over the last 8 years” stuff isn’t part of a long term warming trend? Just sayin’. ***Yes…an overall warming trend that began 11,000 years ago when the last ice age reached its peak. Dispassionate scientist alert: “…soared past…” Actually, looking at the Mauna Loa graph of CO2, it shouldn’t finally “soar past” 400 ppm until 2016. Which doesn’t detract from the main point, the zero trend in arctic temperature. Hyperbole does not help the reasoned skeptic’s cause. The fact that the Warmista’s are so utterly amazingly wrong is proof enough. 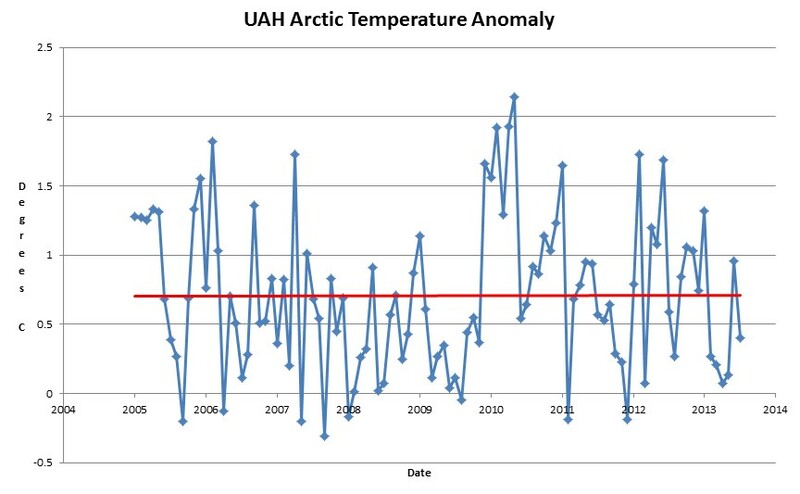 What happened to Arctic amplification after the lowest extent on the satellite record? RSS August is now out. Newsflash: WWF lists canary’s as an endangered species! With the closure of coal mines world wide, habitat destruction is proving fatal for the humble canary. OK, I’m thinking you guys are missing the AGW GHG amplification signal. It occurred March 21 2010 at around 1:21 am. Once it had done it’s job, it was tired, very tired. We might see it in another 35 years when the PDO goes positive.